Can Boosting Cell Signals Boost Your Business? Competition drives business, both for you as an installer or integrator, as well as for your customers. And if you’re looking for a competitive edge, adding cellular signal boosters to your product line might be a very profitable ticket, indeed. You probably know the basics about cell signal boosters: In a nutshell, they take a weak signal – sometimes one that’s even too faint for a cellular device or handset to detect – and amplify it to a strong, reliable signal level. What you may not have realized is that they can provide you with an easy up-sell opportunity for many of your current, past and future clients. Why? Well, consider this: no technology is having a greater impact on our ability to remain competitive than cellular communications. Those companies not maximizing their cell phone capabilities risk losing a competitive edge. And if that happens, they risk falling behind their competitors and becoming irrelevant. Now consider that there are almost 28 million small and medium sized businesses in the United States, and according to a report conducted by Harris Interactive and Bank of the West, 88% of them use cell phones for business. And of that number, CTIA research states that 45% of them say cell phones are essential. It’s widely understood that cell service can be unreliable in rural or outlying areas because of distance from the nearest cell tower, terrain or vegetation. But these are hardly the only cause of a faint signal. Building materials and construction methods can also block or weaken signals, leaving many urban and suburban customers with inadequate coverage. Because weak or spotty cell service can occur almost anywhere, a lost or weak signal can result in frustration and missed business opportunities. Fortunately for you as an installer, it creates the opening to turn frustrations into satisfaction. This is a tremendous opportunity, one that many installers and integrators are already benefitting from. So even in major cities that are well covered by cellular networks, construction materials, particularly concrete, steel, and window films used to increase energy efficiency and reduce sun glare, will often block a signal from getting inside where it’s needed. 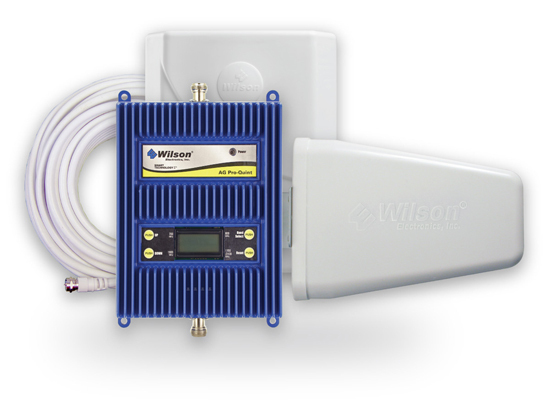 What’s Involved in Installing a Cellular Signal Booster System? Cellular signal boosters are an easy and effective solution for you to help your customers boost their cellular signals and improve connection quality inside offices, cars, and homes. And installing them involves more of what you are already doing. A typical booster installation for a building includes an outside antenna, a signal booster unit (also known as an amplifier) about the size of a paperback book, an inside antenna or antennas, to retransmit the amplified signal within the building (mounted on or inside a wall or ceiling), and cable to link all the components. So for any installation or integration professional, it’s probably just an extension of the work you are currently doing. Well-designed installation kits can simplify and expedite installations on both new constructions and retrofits. And because the boosters are designed with easy-to-use controls that adjust the downlink amplification level and the uplink transmission power, they allow the installer to quickly optimize performance for the particular structure and location where the installation is taking place. Remaining competitive in business is not a choice. It’s vital for you and your customers to maximize relevant communication technology and product solutions. Cellular signal boosters give you the ability to simply and efficiently remove one of your customers’ frustrating and unnecessary obstacles that can impact their ability to meet their customers’ needs. Blake Seese is Business Development Manager, Custom Integration for Wilson Electronics, LLC, the leading maker of cell phone signal boosters and accessories. The St. George, Utah-based company designs and manufactures all its boosters in the United States.